Granada is the capital of the province with the same name, situated in the eastern part of the region of Andalucia. Geographical and scenic diversity characterizes the land. There is the coastal area with its warm climate; the extensive, fertile Genil plain; and the mountainous regions with a colder climate, where we find the 3,481 metre Mulhacen, the highest peak on the peninsula. The city of Granada is located at the foot of the Sierra Nevada mountains at the confluence of the Darro and Genil rivers. Its unique history has bestowed it with an artistic grandeur embracing Moorish palaces and Christian Renaissance treasures. As the last Moorish capital on the Iberian peninsula, it also holds great symbolic value. Granada has been shaped by the hills, where the old dostricts in the Albaicín and the Alhambra were founded, brimming with steep, narrow streets, beautiful nooks and corners, and marvellous landscapes. The new part of the city is situated on the plain, crisscrossed by the large arteries of Gran Vía de Colón and Calle de los Reyes Católicos, and where the busy streets around the Cathedral are found. The Moors crossed the Strait of Gibraltar in 711 and settled in what was then a small visigoth town perched atop the Alhambra hill. Here they settled, erected walls, and laid the foundation for the prosperous civilization that would follow. It was in the 9th Century when Granada rose to importance after the fall of the Caliphate of Córdoba. Its splendour was reached in 1238, when Mohammed ben Nasar founded the Nasrid dynasty, and the kingdom of Granada stretched from Gibraltar to Murcia. 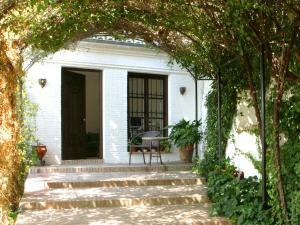 Carmen de la Alcubilla del Caracol is located in Granada, a 10-minute walk from La Alhambra. This dynasty bore twenty kings until King Boabdil was forced to surrender Granada to the Catholic monarchs, King Ferdinand and Queen Isabella, in 1492. During three centuries, a magnificent and rich Islamic culture flourished, leaving Granada with architectural marvels of the caliber of the Alhambra, declared a World Heritage Site along with the Generalife and the Albaicín. After the Reconquest, the city continued to thrive, stimulated by the Catholic monarchs who ordered the construction of new civil and religious structures. The Alhambra and General life. A short stroll from the centre of the city to the “red hill” will lead us to the most enchanting structure of Hispano-Moorish art from the Nasrid culture, the Alhambra. The journey begins at the square called Puerta Real here take the street Calle de los Reyes Católicis, while beneath it the Darro River flows, chanelled at the beginning of the 19th Century. To the right at the Plaza del Carmen, there is the Town Hall. 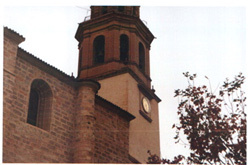 (Ayuntamiento), installed in a former convent of the Carmelite Order finished in 1627. Nearby, at Calle Mariana Pineda number 40, you will find the Corral del Carbón a former Moorish corn exchange and inn from the 13th century, featuring a splendid archway entrance. Standing in the Plaza de Isabel la Católica, there is a monument to Isabella accompanying Columbus, the work of Mariano Benlliure in 1892 to commemorate the discovery of America four hundred years earlier. To reach the Alhambra, you can take the Cuesta de Gomérez which ends, like so many streets in Granada, at a gate or “puerta”. This particular one, the Gate of Las Granadas has three arches and was built in 1536 by Pedro Machuca by order of Carlos V.
The oldest fortress in Granada is the Bermejas Towers, the main entrance to the Alhambra is at the south side and is the Gate of Justice. The Wine Gate provided access to the high part of the Alhambra; the main side with the pointed horseshoe arch faces the Alcazaba. The most important of the three palaces is the Comares Palace. Built by the sultan Abul-Hachach-Yusuf I. Its façade is exquisite. El Patal gardens provide access to the Generalife built in the 14 th century and surrounded by splendid terraced gardens with fountains, pools and spouting water. It was the summer residence of the Nasrid Kings. The Cathedral was built between1518 and 1704, and although started in the Gothic style, most of the structure is Renaissance. It has a basilica ground plan, and the 17th century façade, composed of three large arches, was the work of Alonso Cano and evokes the great Roman triumphal arches. The church of El Sagrario that you can see today is the 1704 reconstruction, forming part of the group of buildings attached to the Cathedral and Royal Chapel. Its ground plan is in the form of a Greek cross, and it contains important paintings from the 15th and 16th centuries, as well as a lovely Renaissance baptismal font carved from white marble. Located in the hills just outside Baza in Granada province, Al Jatib has an outdoor pool and hammam with massages and treatments. The millenary town of Baza in Granada province, the primitive Iberian and Roman Basti callled Batza by the Muslims, has a rich monumental heritage left by the different cultures who have inhabited it throughout history. It is a town with interesting remains which can be visited in the Archaeological Museum. The monumental Colegiata Concatedral de la Encarnación is of major importance as well, and the town features some oldest Arab baths in Spain. Between Baza and Castril, the visitor will find a lunar landscape scattered with dave dwellings such as those in Benamaurel, where the blue waters of the dam of Negratín contrast with the ochre tones of the earth. Castril has white houses perched on a massive rock woth the remains of the Islamic castle at the top. It is the gate to the Parque Natural de la Sierra de Castril, which boasts the Cueva de Don Fernando, the longest and deepest cave in the province of Granada.